December 8, 2006–KPW: Butch Miller honored New Zealand legends Al Hobman, Bob Crozier, Bruno Bekkar and Rip Morgan. Bottomless Jack wrote: Originally from New Zealand, Morgan worked some as a heel in Memphis in 1985 (teaming with Jonathan Boyd and feuding with the Fabulous Ones), Morgan also wrestled for Carlos Colon’s WWC during 1986 and had a small feud with the Invader #1 there. Rip Morgan worked in the US on the undercard and as a flag bearer for the NWA, first with the Sheepherders in 88 and later for the Iron Sheik in 89. 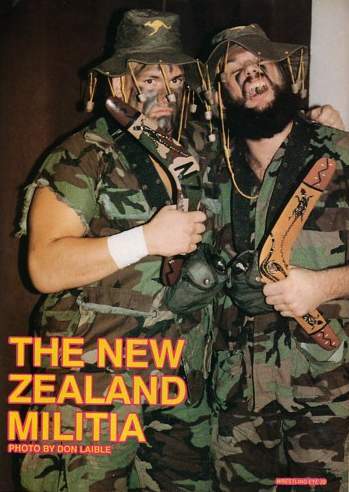 Morgan toured New Japan Pro Wrestling during the first quarter if 1989 as well.. Morgan formed a semi-successful team with Jack Victory which saw several different gimmicks from the duo including “The New Zealand Militia” in the NWA, and a Blue Blood type gimmick called “The Royal Family”…The Royal Family appeared in a few NWA/WCW PPV’s in late 90 and early 91, losing to Muta & Saito at Starrcade 90 and also losing to the Southern Boys at WrestleWar ’91. And later in the Dallas based Global Wrestling Federation the team changed their name to the Maulers, becoming a more rugged team and they feuded with Mark & Chris Youngblood there. The Royal Family would pop back up for a quick shot in Jim Cornette‘s SMW during early 1992. Hope this helped.